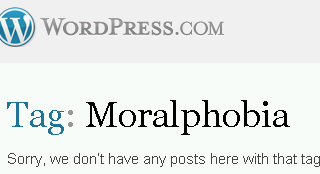 some blogs tagged with- or categorized on wordpress with “moralphobia” or “moralphobe” or “moralphobic” … do NOT appear in wordpress search (URLs). Some blogs featuring those words no longer appear in ANY tag-URLs or ANY category-URLs. hmmmm.. can you smell the moralphobic agenda, too? its the way to see it without supporting it… and since the ideology of the movie is that I am the sole arbiter of truth.. pirating the movie is not wrong for me. 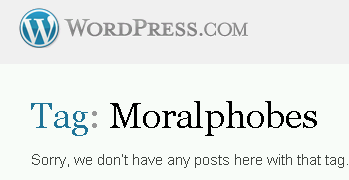 isn’t moral relativism fun?